I took a Wilton class several years back and I learned how to make sugar flowers. They take some practice but can be a lot of fun to make. Once made, these sugar flowers last a very long time in storage. A single flower can make a simple cupcake pop. And a cluster of them can make any cake really stand out. I will try to make a series of sugar flower tutorials. This is my first one, the Primrose. I made white and pink Primroses in this video, but really it can be absolutely any color. The key to successful sugar flowers is the consistency of the icing. Too soft and the icing will come out of piping tips easily but will quickly lose its shape. Too dry and the icing won't come out of the piping tips properly and won't take the proper shape. So I suggest adding the water a little bit at a time until you get the perfect consistency of the icing. Room temperature and humidity can also play a big part in getting the right consistency. Unfortunately, it's just one of those things that you will have to try and practice several times. Have fun and enjoy making these flowers! 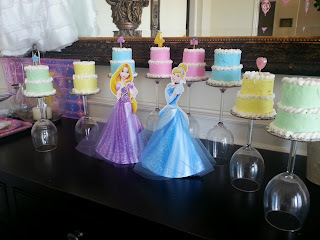 I made a set of mini two-tier cakes for my niece's birthday party, which was Disney Princess themed, of course. Each one of the kids got their own mini cake and they all got to blow out their own candles. Do you like the upside down wine glasses serving as cake trays? My daughter's classmate's sister is having a Sweet Sixteen Birthday and I made this for her. She brought a picture of another cake that she saw that had very pretty floral prints on the cake. I tried my best to achieve the same feel and style of the cake without exactly copying the design. To achieve this design I used rice paper. I used floral patterned stamps and food coloring. And I did a little bit of hand painting to add a few additional details to the flowers. Then I cut out the painted rice paper and simply placed it onto the icing. The icing is just the usual icing that I use, Pastry Pride. 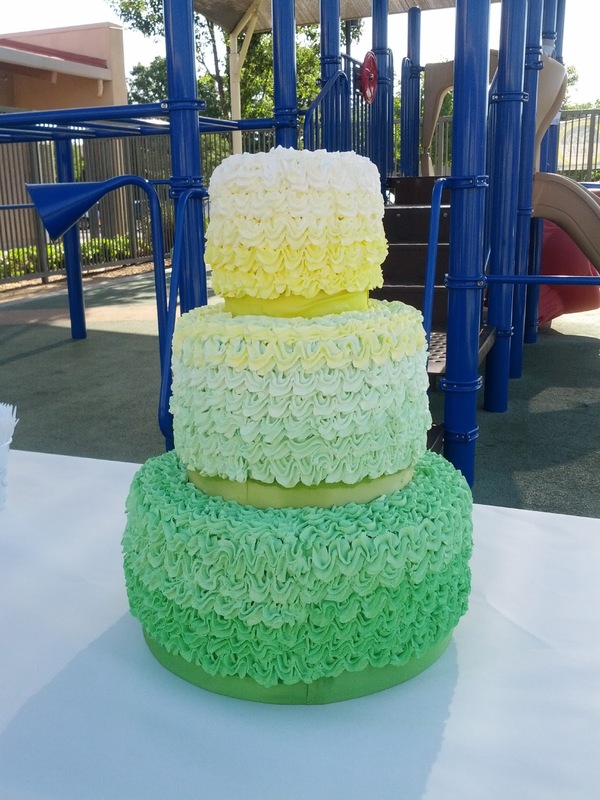 The rice paper sticks to the icing very well and the food coloring is not bleeding into the icing. I think it turned out alright. What do you think? I have a close up picture of the cake bellow. Several people have requested a video version of this recipe, so here it is. Enjoy! I didn't get a chance to create a tutorial for this cake. It was a rush job for a family Easter party. So we decided to make it into a little story. We hope you enjoy it. Story written by my husband Onassis. Story read by my daughter Sophia. Music is "Lavender's Blue" played by my husband.